Securing a strong runner-up result in the first rally stage of the 2018 Desafio Ruta 40, Pablo Quintanilla has made a solid start to the week-long event in Argentina. Determined to keep on fighting for the overall victory at this year’s Desafio Ruta 40, the Rockstar Energy Husqvarna Factory Racing rider has his eyes set on extending his lead in the FIM Cross-Country Rallies World Championship standings. 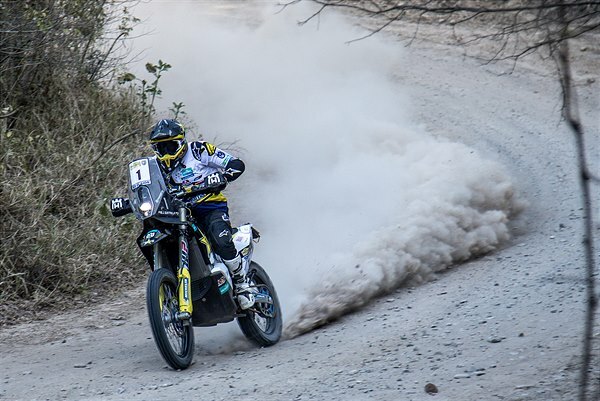 Following his strong outing and podium result a week ago at the Atacama Rally in Chile, Pablo Quintanilla has taken the battle to defend his World Championship to Argentina. Starting with a short Prologue on Sunday, the 2018 Desafio Ruta 40 is a 2,285km point to point rally that takes place in the western part of the South American country. Placing fifth in the event’s Prologue, Quintanilla made the best of his advantageous starting position for Monday’s first and longest stage of the race. Enjoying a steady pace despite treacherous conditions in the Argentinean countryside, Pablo brought his FR 450 Rally home in second position. Starting from the city of Belén, Tuesday’s stage two takes competitors to Tinogasta. It includes a 317km timed special in a total distance of 414km.